The stock market will make 10% a year in the long run.Any correction or bear market is a long term buying opportunity. Market timing is impossible. To attempt it is to waste money and effort. Diversification is the only responsible approach to downside risk management. Especially in the US, stock market investors have been consistently rewarded for taking risk. Past technological leadership, supportive population and economic growth fundamentals, military and geopolitical advantages, high participation rates in stock investments amongst the US population, and past economic and regulatory stability have all benefited the “equity risk premium” justification that says you should get paid extra to take on the risk of buying equities. We don’t know for certain if technological leadership will continue to drive growth (we hope it will). We also don’t know how economic growth will pan out going forward. With substantial challenges to the 10% number on the horizon, it is now reasonable to question diversification alone as the almighty investment strategy, and to take a serious look at market timing as a risk management tool. So can the market be timed successfully? Mebane Faber proposes a simple moving average trend following model that may help us answer the question. His system idea: On a monthly basis (to avoid noise and false signals), own the S&P 500 (and/or other risky index type assets) when it has closed above its 10 month moving average, and sell the same index when it crosses below the 10 month moving average. Displayed with a logarithmic scale, we modeled the system (Tactical S&P 500) since the inception of the S&P 500, alternating between the total return of the S&P 500 index and an approximation of holding short term treasuries by earning a monthly yield equivalent to the 3-month US treasury interest rate. Monthly S&P 500 data since inception in 1926 was provided by CRSP, with treasury data from the St. Louis Fed. The apparent result: Over a very long time horizon, $1 invested in the buy and hold strategy underperforms the market timing approach by nearly 90%. Over almost a century of time, despite being a material number, we do not consider this difference (of a little more than 2% return annualized) in return the most interesting improvement, particularly since implementation and transaction costs by an active manager would consume a meaningful part of those returns. Such a substantial difference in realized downside risk strikes us as very impressive. For human investors, the biggest problem isn’t achieving an acceptable total return; it is their willingness or ability to stick to the program. An 80% loss during the Great Depression coupled with the loss of a job would have been catastrophic to savings, forcing sales at exactly the wrong time. This is Buy and Hold’s fatal flaw. Market timing is impossible. To attempt it is to waste money and effort pursue an alternative risk-reward trade-off. Tactical approaches may serve to help diversify a portfolio and improve risk traits. 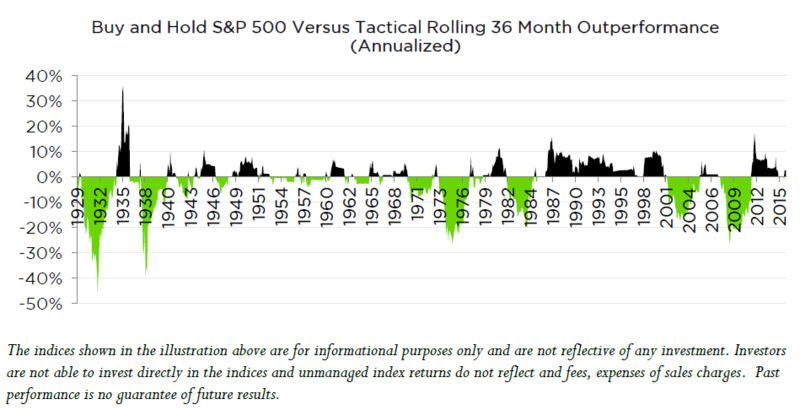 A combined strategy that evenly weights and monthly rebalances the S&P 500 with a tactical approach lowered standard deviation from 18.9% to 13.9%, lowered beta exposure to 70% on average while retaining substantial overall correlation of 94%, and amazingly cut maximum drawdown from 53% to 31% (in 1950 to present period). The investment community seems to broadly believe that acceptance of a tactical investment approach means rejection of Modern Portfolio Theory (MPT) – the driving force behind diversification. We do not see tactical versus passive approaches as mutually exclusive. These results instead show tactical strategies can potentially enhance a portfolio, and absolutely do not conflict with tried and true conclusions about the benefits of using MPT to improve a portfolio’s risk-return tradeoff. Diversification is the only responsible an excellent approach to downside risk management that may be improved by the addition of a tactical trend-following strategy. Like all things to do with the markets, past results are not a guarantee of future results. Despite the possible benefits to downside risk management, tactical approaches will always have periods of underperformance relative to buy and hold approaches, particularly when markets chop around and give false trading signals. Detractors of market timing approaches will readily cite underperformance periods as a justification to abandon tactical approaches. An empirical look reveals a much more consistent relationship between buy and hold and tactical management returns. Black represents periods of Buy and Hold outperforming where green represents Tactical leading. Relative outperformance of each approach cycles for extended multi-year periods. If anything, the oscillation of this relationship is to be expected, and is arguably a consistent feature through history. The shifting relative outperformance between both strategies lends credibility to the idea that tactical strategies have their place in a portfolio next to passive ones, as they offer genuinely needed diversification. Systematically deployed, market timing is not a mortal sin. It’s a strategy for pursuit of the greater good. The material provided herein has been provided by Counterpoint Mutual Funds, LLC, and is for informational purposes only. Counterpoint Mutual Funds, LLC serves as investment adviser to one or more mutual funds distributed through Northern Lights Distributors, LLC member FINRA. Northern Lights Distributors, LLC and Counterpoint Mutual Funds, LLC are not affiliated entities.